Spanish fiestas are an important tourist attraction, an integral part of life and most have a religious or historical motive. Fiestas are partly financed by the town halls and partly by fund-raising events organised by the fiesta committee and the festeros themselves. 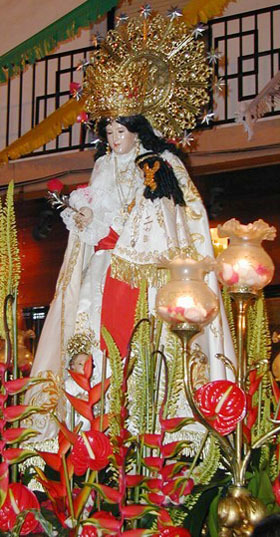 The Moraira Village Fiesta are held on the 15th and 16th of July each year in honour of La Virgén de los Desamparados (The Virgin of the Helpless) and La Virgén Carmen (Patron of the Fishermen). The 16th is a local fiesta and the celebrations start in earnest on 15th. These include street processions with the participants in colourful traditional costumes accompanied by brass bands, games & competitions, bull-running and open-air disco until the early hours of the morning. A coloured brochure and program of events is produced and published by the Fiesta Committee and the advertising revenue helps with financing the fiesta. The principle event on the 16th and is well worth seeing. The colourful statue of the Virgin is removed from the church, paraded around the village and then taken out to sea to bless the fishermen she protects. The Teulada Town Fiesta is held during the week after Easter week in honour of the local saint and town patron, San Vicente Ferrer. The event is held every year and the celebrations are much the same as the Moraira Village fiesta. La Font Santa (Holy Fountain) Fiesta. Font Santa is situated just outside Moraira adjoining the Go-Kart track that borrows the name. The festival is held at the beginning of July. The story is that San Vicente Ferrer was travelling between Alicante and Valencia, in those days it was quite a difficult journey. Feeling extremely tired and thirsty he whacked a rock with his stick. It is not know if this was inspired by anger and desperation or some saintly motive but water began pouring from the stone. The stone is still there, with the fountain and a tiny chapel. La Fiesta de Moscatell is held in Teulada at the end of August. This equates to a "Harvest Thanksgiving". and the name applies to the type of grape, which is grown in the area and goes into the making of "Mistela" wine. The local brand "ALONE" is marketed by the aptly-named Cooperativa de San Vicente Ferrer. A one-evening event is held at the Plaza de la Ermita de San Vicente Ferrer and entails a public procession, music, and dancing to disco music - and of course virtually unlimited supplies of the season's produce! The Moors and Christians Fiesta in Moraira. This is probably the most popular fiesta in Moraira and takes place on the 3rd weekend in June. Many towns have a Moors & Christians fiesta and these celebrate the expulsion of the Moors from Valencia by the Christians. The participants are arranged in Filas (Groups) who design and produce their own costumes each year at their own expense. This invasion by the Moors is re-enacted and they sail into the beach, with canon- and musket-fire, and overrun the Castle held by the Christians. The following day the Christians stage an attack and retake their castle with even more noise. Exciting and noisy events with the Red Cross Ambulance standing by. The fiestas continue for the whole week, including both weekends, and feature daily street processions, games, competitions, bull-running, all-night disco etc. Once they have witnessed the spectacle many visitors come back for their holidays at the same time every year. Approximate dates for each year. For full details consult your holiday company or the Moraira Tourist Office. Street parades, music & dances, fireworks, bull-running etc. Typical Moors & Christians Fiesta. The Benissa is held at Fustera, which is a tiny beach community just south of Moraira. The actual fiesta takes place only on the beach (as there is not much else there) and comprises music dancing and other "frivolities" and goes on literally day and night. The have their share of fiestas for such a small town! This is the fiesta of the Aduanas (Customs and Excise) - believe it or not! 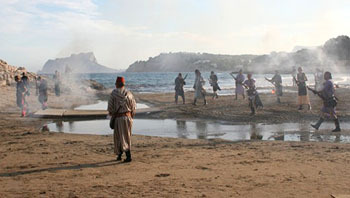 It is held in the Javea Port Area and has a strong Moors & Christians flavour. San Jose is the patron saint of the State of Valencia. Huge wax and paper mäché statues are burned in the streets of all the main towns. In Alicante and Valencia there are dozens that are torched one after the other.